Political Geography has always been a topic that interested me and I wrote this article back in July 2012 and posted it on a former colleague of mine website called Informing Opinions. That of course was 10 months ago and the civil war in Syria has dragged on and the toll of death and destruction has continued to mount. But what of the question of the state’s territorial integrity and viability? 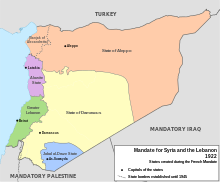 Could a broke up Syria look like its French Mandate predecessor? The map of Syria as it stands now is pretty messy. Much of the north are now in opposition hands while fighting continues around the same hot spots of Aleppo, Damascus and Homs. Meanwhile the government retains some sembalance of control and loyalty from the Alawite dominated regions along the Mediterranean coast. It was in this area that reports began to emerge over the past week or so of ethnic cleansing in the Bayda and Baniyas as Alawite militia’s loyal to the Assad regime targeted and exterminated Sunnis in the region. Since this coastal area has not been one of the primary fronts of battle between government and opposition forces in Syria the only purpose of this needless bloodshed is to lay the ground work for an Alawitie homogeneous region along the coast. As US Secretary of State John Kerry predicted back in January violence begets violence and will result in the enclavization and breakup of Syria. We could be witnessing the key step on this process. Then there are the Kurds of northern Syria. In control of numerous towns in north and western Syria, they have managed to develop their own state within Syria as many of these towns are now self-governed. Kurdish forces have clashed with both Free Syrian Army and Government forces in and around these communities and Kurdish areas of the country. This past winter, Kurdish forces turned on each other as rival political groups jockeyed for control and influence in this quasi-independent areas. It is likely that these Kurdish groups will settle for nothing less then what Iraqi Kurds now enjoy and as the relations between Syrian and Iraqi kurds continue to grow it is likely that Syrian Kurds will strive hard to breakaway from Syria proper. For Syria’s neighbours many of the concerns that I addressed in my original article still remain: refugees and humanitarian issues, fighting spilling across their borders and the threat of chemical weapons (which have now been widely accepted to have been used) falling into extremist or terrorist hands remains pressing. With the plans for the proposed US/Russian led peace conference already hitting snags it is likely that the conflict will continue through another hot arab summer, further entrenching the need for a resolution and likely requiring to permanently break up Syria. This past week’s decapitating strike by Syrian opposition forces resulted in the deaths of Defense Minister Dawood Rajiha, his “deputy” Asef Shawkat (Assad’s brother-in law), Assistant Vice President Hassan Turkmani and Hisham Ikhtiar (Syria’s National Security Chief). The brazen bombing showed that the situation in Syria has recently deteriorated much quicker than many expected; the ability of the ever emboldened opposition to strike at the higher echelons of the Syrian regime is becoming a potential game changer. As the situation continues to spiral out of control, reports of ethnic cleansing of neighbourhoods and villages to the driving out of Iraqi refuges are raising sectarian tensions. With pundits all agreeing that it is not a matter of “if” the Assad regime will fall but rather “when,” attention needs to be paid to what the aftermath of his fall might be. Syria is a divided nation in a divided region, where the majority Sunni population has been repressed at the hands of the Alawites (Shiites). Meanwhile the Kurds of Syria much like Kurds in Iraq and Turkey has suffered years of repression that has led to various nationalistic movements within the group. Smattered between these major groups are enclaves of Druze and Christians who are positioned to be potential targets of reprisal for their years of supporting the Assad regime. 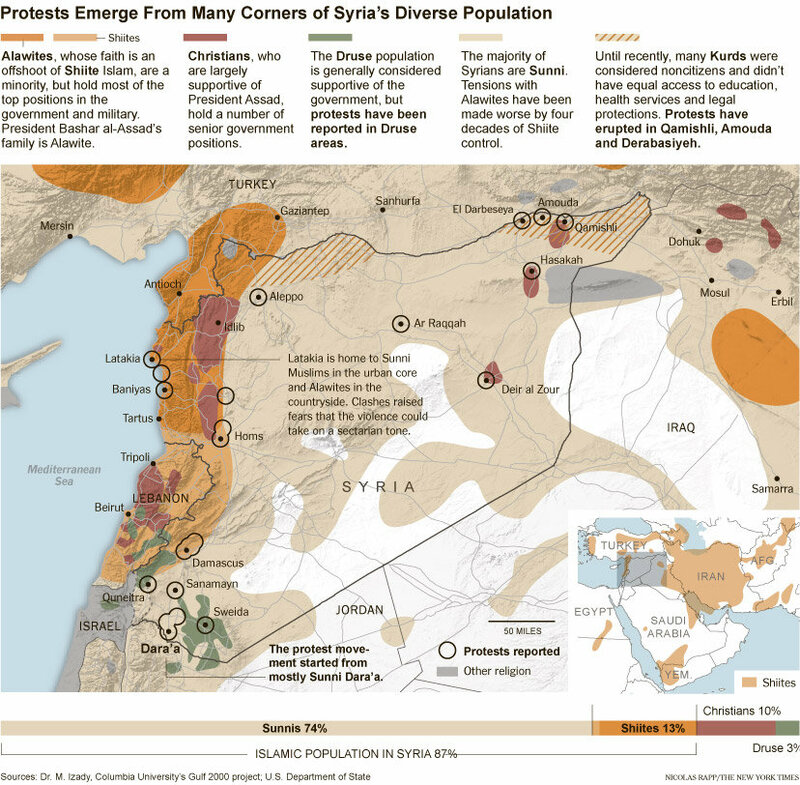 Looking at a map of Syria, you can certainly identify geographic areas that are the likely strongholds of the various sectarian groups and where they can take hold. As the regimes’ control continues to weaken over vast tracks of the countryside the power of these sectarian groups will continue to grow, which could result in the Balkanization and breakup of Syria. Of course, a post-civil war federal arrangement could be struck in Syria, but unlike Iraq (the only other federal state in the region) there are not vast sums of oil wealth that can be redistributed to placate the various groups. This of course raises the question of what will be the glue that binds Syria together. With no clear answer to this question and the presence of numerous groups that have a lot to gain by breaking up Syria, it is a scenario that leaves much to be considered. For Sunni Muslims, the opportunity for self-governance, to rule their own country, has been a long time coming. Making up a clear majority of Syria’s current population, any democratic system of government would ensure Sunni dominance (depending on the political parties and potential vote splitting). Sunni’s have long been shut out of higher levels of governments and leadership positions by the Assad regime so it would likely result in key government posts changing over, along with the patronage and corruption networks that accompany them. Arguably the Sunni’s have the most to gain by holding Syria together but in order to do so they will likely have to make numerous concessions to the other sectarian groups. If the Sunni have the most to gain, the Alawites have the most to lose. This thirteen or so percent of the Syrian population has controlled the country for decades and from the commanding heights of government, the webs of patronage spread lining the pockets of many in this community. For years, Alawites loyal to Assad ran the security services and were responsible for countless crimes against their fellow Syrians and as a result, the risk of reprisal is quite high. Geographically, the Alawites are concentrated along the Mediterranean coast, which is shared with the majority of Syria’s Christian population. What could result is the formation of a “new-Lebanon” where an Alawite-Christian bargain could be struck for their mutual protection from a vengeful Sunni majority. This new nation would likely find friends (and possible patrons) in both Iran and Lebanon (particularly Hezbollah) as their common Shiite perspectives and existing relationships from the current regime could carry over. As for the Kurds, the possibility of a disintegrating Syria brings hope to the nationalist groups (both in and outside Syria) who have long fought against not only the Syrian regime but Saddam in Iraq and Turkey to the north. It is unlikely that the Syrian Kurds would settle for any arrangement short of their own autonomous region within the state (much like their neighbours in Iraq). In fact, Syrian Kurds have already gone so far as to boldly declare the independence of West Kurdistan, with the city of Afrin as the capital. Although no official recognition has come for this new Kurdish “state,” the fact that plans are already in place for it point towards its formation when Assad finally falls. Unfortunately for the Kurds, their enclaves are nestled along the Turkish border, and Turkey has been quite clear in the past that it would not accept an independent Kurdish state as it would undermine its own territorial integrity. Neither the Druze nor Christians of Syria have the population or geographic concentration to form a viable successor state on their own. As already noted, the Christians are concentrated in the North, mixed into Alawite areas near the Mediterranean between Lebanon and Turkey. Their state would require some sort of arrangement with the Alawites. Meanwhile, the Druze live predominately in areas South of Damascus, sandwiched along the border regions of Jordan, Lebanon and Israel. A Druze state would likely be made up with Sunni Muslims and as a result, there is a question of whether the Sunnis of the region would be willing partners in this venture as they have much to gain in a post-Assad Sunni dominated Syria. For Syria’s neighbours, the disintegration of the country is, for the most part, not the desired outcome of this conflict. The question is, what can they do? Unfortunately for them, without some direct intervention, there isn’t much they can do. As already mentioned, Turkey is worried about the impact over its own Kurdish population if a new Kurdish state is established in Syria. For Lebanon, a country already divided on sectarian lines, the disintegration of Syria could be a mixed blessing. For decades, Syria has interfered with the internal politics and processes within Lebanon. However, the process of this messy divorce in Syria already shows signs of spilling over the border into the streets of Lebanon. For Israel, the end of Assad means dealing with the unknown, which is something the Israelis prefer not to do. Although they have no love for Assad’s Syria, the Israelis fear who or what could replace the regime and there are also more immediate concerns regarding Assad’s chemical weapon stockpiles. That being said, the end of Syria proper could solve some of Israel’s problems by ending patronage for Hezbollah; the alliance with Iran; possibly allowing Israel to formally claim the occupied Golan Heights; and potentially a non-Muslim (Druze) state on its border. For Jordan and Iraq, the collapse of the Shiite control in Syria could result in a friendly Sunni state in Damascus and end the Syria-Iranian Axis but it comes at the risk of both fighting and refugees spilling over their boarders. Regardless how the conflict within Syria proceeds, it is quite clear that it will have a dramatic outcome for the Middle East. If Syria remains a unified nation (an outcome that is not certain by any means) it will likely look and act dramatically different from the current model. If Syria as we know it currently comes to an end and breaks up into several smaller sectarian states, it will likely usher in a new period of instability and turmoil for the Middle East. Pandora ’s Box has opened and the contents can’t be returned, pundits and politicians are in agreement that Assad’s reign is, one way or another, finished; the only question is what will happen once he is gone. Pingback: gingerpolitics | 2014: The Year of Redrawing Maps?? ?